Top of the pyramid. 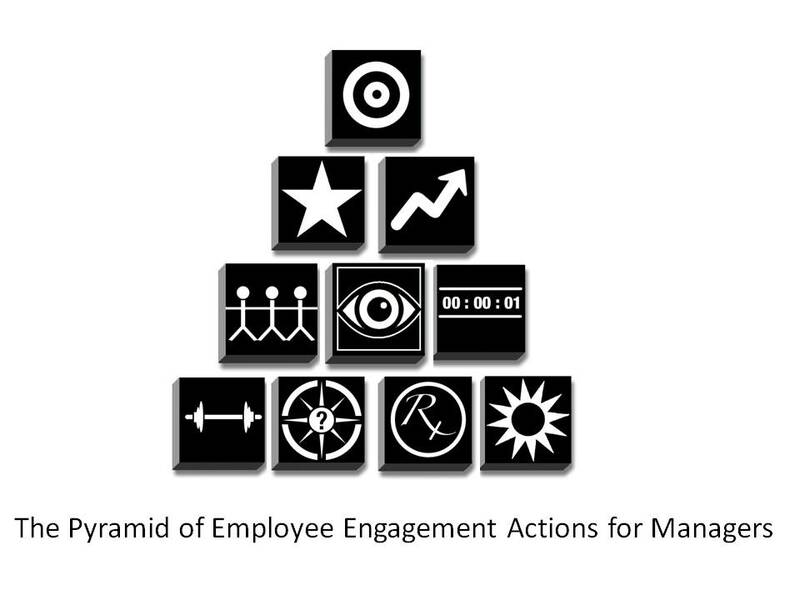 Based on extensive work in employee engagement, I constructed a pyramid of employee engagement actions for managers. There are 10 building blocks to full engagement and at the top of the pyramid on the 10 things managers must do to increase employee engagement is Achieve Results. 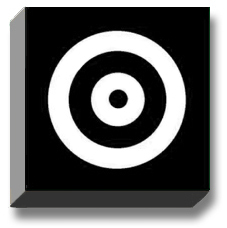 The symbol used for achieving results is a target to ensure we know where we are aiming our engagement efforts. 12 key concepts. The 10 block pyramid of engagement is the structure for a course for managers to improve and increase engagement. Here are 12 key points from the course that connect achieving results with employee engagement. Results defined. The definition of a result is a consequence, effect, or outcome of something. The something we are looking for here is engagement. In addition in this integrated view of engagement into work, employees will also contribute to the development of targets and results for the organization. Clearly stated and clearly communicated. Are your results clearly stated? To ensure the organizational results are clear to employees ask a number of employees on the spot to state the results the organization is working to achieve. Can they state them without hesitation or ignorance? If not, make sure what is clearly stated is also fully communicated. Drucker’s drive for results. Peter Drucker focused extensively on results, including writing the book, Managing for Results. He stated that results come from leveraging opportunities rather than focusing on problems. Resources must go to opportunities and to achieve economic results we must concentrate. As a manager ensure the resource of engagement is directed towards results not aimless activities. If achieving results is a weak spot on your pyramid of engagement I encourage you to read Drucker’s classic book on managing for results. Results in reverse. When we know specifically what we are working to achieve we can reverse engineer from the results to the specific actions we need to fully engage with to achieve those results. Create white space so that employees can input into the crafting of results. Did employees have an opportunity to influence results. In full engagement, we have moved from results being given to employees to also being created by employees. Remember the following two keys lines as you develop the results that you are working to achieve. If you want everyone on the same page give them an opportunity to write on the page. Never do anything about employees without employees, including determining results. What you really want. Ensure that the results you are focusing on are what you and your reports really want. I encourage you to contemplate the “spice girl question.” This is part of the lyrics from one of their ear-worm like classics: I’ll tell you what I want, what I really really want, So tell me what you want, what you really really want, I’ll tell you what I want, what I really really want, So tell me what you want, what you really really want. Pull results rather than push results. Do you and other employees feel excitement and interest in the results the organization is trying to achieve. Do the results have meaning? When we find results engaging we are powerfully pulled into engagement rather than feeling pushed to engage. TEAM up for engaging results. Apply the TEAM acronym as a quick guide to your results statement: Are your results: Timed – Engaging – Achievable – Meaningful? In regards to timed and specific, Don Berwick, the health care leader who was responsible for the 100,000 lives campaign was always reminding us: Some is not a number and soon is not a time. Based on achieving high levels of engagement and successful results the campaign is now the Protecting 5 Million Lives From Harm campaign. 10 measures. Skip Reardon offered 10 insightful reasons to measure results ranging from clarifying expectations and directing behavior to promoting understanding and improving execution. I encourage you to read his post to learn more about the four mentioned here and the additional six outlined in his post, The Top 10 Reasons to Measure Results. Locus of engagement. Employee engagement has shifted away from a general pervasive measure of connection to being localized to different areas or results. For example your report’s locus of engagement may be on a task while your locus of engagement is the people achieving those tasks. Our results could be financial, environmental, or wellbeing. A strong connection between engagement and specific results ensures that engagement is integrated into work and management rather than an additional demand and helps give a rifle-like powerful specificity to engagement rather than a shotgun feel good satisfaction about work. Target-Engagement fusion. At the highest level of engagement, we engage so fully with the target, that the target and our engagement become one. This was eloquently described in Eugen Herrigel’s book The Zen of the Art Archery. This would be the ideal state of engagement and demonstrates a model of what is possible when we engage fully with results that are meaningful, focused, and enriching. Next up, maximize performance. 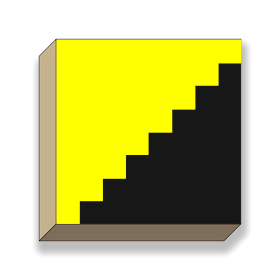 In the Employee Engagement Pyramid, the 10 blocks are very connected. We cannot reach the heights of achieving elevated results without the other 9 blocks that support this. Check into this site next week for the second post on Maximize Performance in this 10 part series building the Pyramid of Engagement for Managers. David Zinger created The Pyramid of Employee Engagement as a powerful tool to help managers understand the 10 key actions they can take to build full employee engagement. Contact David Zinger at zingerdj@gmail.com or phone David Zinger at 204 254 2130 to learn more or request the course for your company, organization, or conference. Bonus resource for results. JD Meier has written an excellent guide to agility and results. I encourage you to take a look at his extensive and helpful book: Getting Results the Agile Way. The link in the previous sentence to Meier’s book will take you to free online wiki version of the book full of excellent tools, checklists, and methods. Employee Engagement Eclectic Resource to Improve Work and Life. David Zinger offers you great links and resources to enhance and improve your work and life engagement. This edition of 19 Eclectic Resource Zingers range from overcoming information overload and a great time lapse video of Vancouver to the Presentation Zen design book. David Zinger, M.Ed., is an employee engagement expert. He offers exceptional education and consulting on employee engagement for leaders, managers, and employees. David founded and moderates the 2025 member Employee Engagement Network. His website offers 1000 articles relating to employee engagement and strength based leadership. Email: dzinger@shaw.ca Phone 204 254 2130 Website: www.davidzinger.com.